The World Academy for the Future of Women is a bold and daring leadership program focused on developing young women for leadership roles that will address and achieve the United Nations’ Millennium Development Goals (UN-MDGs) and UN Sustainable Development Goals. Beginning on the campus of Sias International University in 2009, the World Academy grew from a one-year program for 100 women to a multi-level three-year program for women, and a Men’s Academy for the Future of Women, a program requested by men students, which replicates the women’s program and prepares men to support the advancement of women. To advance and accelerate the leadership of women worldwide. To empower women through the discovery of their passion, purpose, and path to success, calling forth the full expression of human possibilities through collaborative and inclusive partnerships. Students may apply to become member of the World Academy in their freshmen, sophomore, junior or senior year. All students begin as First Year Academy members and progress through the program based on their performance and commitment to improve their leadership abilities and perform in leadership roles on campus, in their community, their country, or in the world. World Academy members are chosen through a process of application, references and interviews. Students accepted as World Academy members participate 8-10 hours each week attending seminars, project research and design labs, open forums, and coaching sessions. In addition, members become a team member in one of the World Academy Projects focused on one or more of the United Nations Millennium Development Goals-UN Sustainable Goals. Advanced members may create new projects or enlarge the scope of an existing project. No academic credit is given to World Academy members. World Academy Members pay no fees to participate in the World Academy. 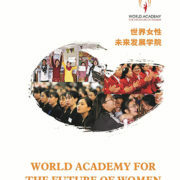 The World Academy curriculum is delivered in eight (8) modules. Each module is four (4) weeks long, delivered by a member of the World Academy Facilitator Body. The World Academy Facilitator conducts the seminars, labs, coaching, forums and the management and expansion of Academy projects. World Academy members receive a Passport to Global Leadership at the completion of each year designating the curriculum outcomes and Academy Facilitators who led their modules.